This article reviews a range of approaches to calculating insulin requirements for people with type 1 diabetes. The simplest approach is standard carbohydrate counting, which may be ideal for someone whose diet is dominated by carbohydrates. Bernstein recommends standardised meals for which the insulin dose is refined based on ongoing testing and refinement. Stephen Ponder’s ‘sugar surfing’ builds on carbohydrate counting, with correcting insulin given when blood glucose levels rise above a threshold due to gluconeogenesis. The food insulin index approach predicts insulin requirements based testing in healthy people of the insulin response to popular foods. The total available glucose (TAG) advocates a ‘dual wave bolus’ where insulin for the carbohydrates is given with the meal, with a second square wave bolus given for the protein which is typically slower to digest and metabolise. having a reliable method to account for the insulinogenic effect of protein. Everyone’s diabetes management regimen is going to be different. There will be a degree of trial and error to find what will work best for you. This article reviews a number of approaches that you can learn from to see what suits you. In the 1970s Dr Richard Bernstein got hold of a blood glucose meter (long before they were easily available) and started experimenting on himself to understand how much a certain amount of carbohydrate raised his blood glucose levels and how much insulin he required to bring his blood glucose back down. From this style of experimentation we can determine the “carbohydrate to insulin ratio” (i.e. how much insulin is required for a certain amount of carbohydrates). Carbohydrate counting is now the standard approach that most people with type 1 diabetes are taught. This approach involves estimating the grams of carbohydrate in your food for each meal. 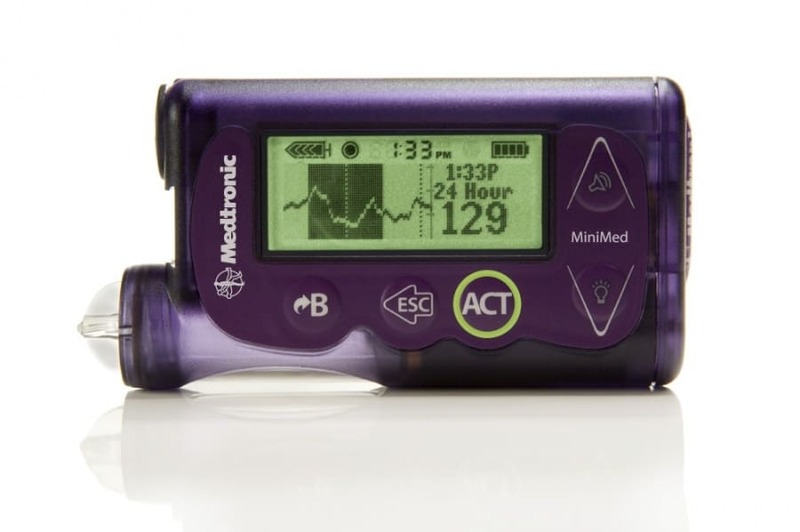 With this knowledge you can then program the amount of carbohydrates eaten into the insulin pump which calculates the insulin dose based on a pre-set carbohydrate to insulin ratio. The advantage of this approach is that it is relatively simple. However it does not consider the insulin required for protein which is typically addressed with correcting doses or sometimes basal insulin. Dr Richard Bernstein advises that his patients, in addition to restricting carbohydrates (i.e. no more than 6g of carbohydrates for breakfast, 12g for lunch and 12g dinner), to have the same meals every day which allows insulin doses to be refined to optimise for blood sugars. If your blood glucose levels run high one day you can add a little more insulin the next day or a little less if they are running low. Bernstein also advises targeting an average blood glucose of 83mg/dL (4.6mmol/L), and that you correct if blood glucose levels go outside a ten point range from this target (i.e. 73mg/dL to 93mg/dL or 4.0mmol/L to 5.2mmol/L). A small bolus of insulin is given to bring blood glucose levels down and a certain portion of a glucose tablet is used to bring blood sugars back up precisely. Bernstein advises that people with type 1 diabetes modulate the quantity of protein to manage their weight. If you’re a growing child, protein is essentially unrestricted. If you’re trying to lose weight protein can be reduced to further reduce insulin. Bernstein says that protein requires about half as much insulin as carbohydrates and outlines how to dose for it in this video from Dr Bernstein’s Diabetes University. In practice, though, his approach to dosing for protein requires consistent meals and fine tuning of insulin dose. Another popular method is ‘sugar surfing’ which is effectively a ‘bolt-on’ to carbohydrate counting developed by Dr Stephen Ponder to manage the glucose response to things other than carbohydrates. This approach involves dosing for carbohydrates with the meal, and then watching the continuous glucose monitor (CGM) and giving regular ‘micro doses’ of insulin to keep blood sugar under around 93mmol/L (5.2mmol/L). Typically two or three separate doses will be required to bring a ‘protein spike’ under control for someone with type 1 diabetes. Injected insulin works over a period of up to eight hours and it is difficult to match the timing of the insulin action with digestion. The advantages of this approach are that it allows for the variability in the time of protein digestion which varies from person to person and is different for different foods and hence difficult to predict accurately. I think the secret to making ‘sugar surfing’ work is to turn the waves that you’re surfing into more manageable ripples by following a diet with a reduced insulin load. One of the experiments documented in Clinical Application of the Food Insulin Index to Diabetes Mellitus (Bell, 2014)  demonstrated that type 1 diabetics calculating their insulin requirement using the food insulin index approach achieved significantly improved blood glucose control compared with those using standard carbohydrate counting. Estimating the insulin required for the meal from carbohydrate and protein rather than carbohydrate alone is potentially a massive step forward in improving blood sugar control for people with type 1 diabetes. The limitation of using the approach practiced in the study is that the food selection tested is limited to the one hundred or so popular processed supermarket foods. If you’ve read my blog you’ll know that I’ve tried to develop a robust method for calculating the insulin requirement for foods based on their macronutrients without having to test them in vivo (i.e. in real, living people). The chart below shows how we can use the food insulin index test data to more accurately predict the insulin demand of a particular food using this formula. Rather than separating doses for carbohydrates and protein, the food insulin index approach assumes that all of the insulin is given with the meal. The risk with this is that the insulin will take action before the protein digests which will lead to low blood glucose. The TAG (Total Available Glucose) approach is based on a book by Mary Joan Oexmann published in 1989. This method calculates the insulin required for carbohydrate, protein (54% of carbohydrate) and fat (10% of carbohydrate). If we gave all the insulin calculated for both carbohydrates and protein when we sat down to eat a high protein meal it is possible that the insulin would take effect before the protein digested, leading to low blood glucose before the gluconeogenesis from the protein had time to kick in. To deal with the fact that glucose from protein can take longer to show up in the blood stream people who follow the TAG approach typically use a ‘dual wave bolus’. The insulin for the carbohydrates is dosed with the meal, while the insulin for the protein is infused slowly as a separate “square wave bolus” over a period of three hours or so. The need for the carbohydrate and protein boluses to be split will depend on the amount of protein in your meal and how quickly protein raises your blood sugars. A few people who achieve excellent blood sugar control simply use two separate boluses – one for carbohydrates before the meal with another one for protein around an hour after the meal. This approach requires that the insulin for the protein and carbohydrate are calculated separately with the protein bolus being given a number of hours after the meal. This approach can be refined using a CGM to confirm when the blood sugar response to the protein kicks in and hence when the bolus for protein is required. To assist in calculating the bolus for carbohydrates and protein Ted Naiman of Burn Fat Not Sugar has created this insulin calculator. You can run it on your computer or phone, enter the properties of the food that you are about to eat and it will calculate the appropriate dose for carbohydrate and protein. The outputs from this calculator will give you all the required data to follow any of the insulin dosing strategies above. People who have used it so far have found it beneficial. An example screen grab from the calculator is shown below with the explanation of inputs and outputs following. If you are using a manufactured food product in a packet you can simply use the nutritional details per serve (protein, fat, carbohydrates) and then factor for the number of serves. If you are in the US you will need to enter the total carbohydrates and fibre values. If you’re in the UK or Australia you don’t need to enter the fibre as it is already subtracted from the carbohydrate count. The protein multiplier is based on the food insulin index testing in non-diabetic people,  however you can modify this if you want, based on your own trial and error testing. The analysis of the quantity of amino acids (as detailed in the article the insulin index v2) suggests that this value is unlikely to exceed 80 to 90%. You can enter your bolus insulin on board (BoB) which will be subtracted from the carbohydrate insulin dose. The first line of the outputs is the percentage of insulinogenic calories. As a reference keep in mind that a whole egg is about 25% insulinogenic calories. A high percentage of insulinogenic calories is not ideal for people with diabetes and insulin resistance. It may be helpful to select nutritious foods with a low insulin load from this list. The insulin load is calculated using the following formula (i.e. for both carbohydrates and protein). The percentage of glucose from carbohydrate could be used if you were going to split your dose into an initial bolus for carbohydrates with a separate bolus for protein. This value can be entered into your pump if you’re using a dual wave bolus, with the protein bolus typically given over a longer period. You can use the grams of carbohydrates or the quantity of insulin for the carbohydrates and the protein if you’re using separate boluses. If you are following the meals from the blog you will notice that the net carbs, total insulin load and percentage of insulin for carbohydrates have been included in a table at the end of each recipe assuming a standardised 500 calorie meal. Moni has experimented with dosing separately for the protein component of the meal, however it typically turns out that her blood glucose has risen by the time she doses for the protein. It seems that for her, the glucose from the protein (via gluconeogenesis) hits her bloodstream quickly and hence delaying the dose for protein is not appropriate for her. We are also trying to focus on a handful of nutrient dense meals with pre-determined insulin doses. The table below shows the insulin required for a 500 calorie serving for a range of meals. All of these have limited carbohydrates and the insulin dose for the protein is greater than the carbohydrate dose. I have provided hyperlinks to some of the meals that are already published on the blog. If you can’t handle the thought of weighing and measuring and then calculating the insulin dose for everything you eat, as a ‘rule of thumb’ all of these meals require dosing as if they were about 20 to 25 grams of carbs. If you are choosing meals with a low insulin load then the insulin dosing for food ends up representing only about 20% of the daily dose. relatively low percentage of insulinogenic calories (i.e. high fat meals) meaning that the overall insulin dose stays relatively low. We’re all on a journey. I hope this helps you move towards finding a strategy that is optimal for you.